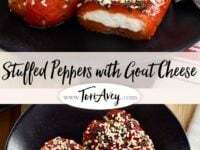 Stuffed Peppers with Goat Cheese – Recipe for roasted bell peppers filled with soft goat cheese, topped with herbs and baked. One of my favorite things to do is visit the kitchens of Jewish friends so I can learn their favorite recipes firsthand. Observing the unique cooking traditions of different families allows me a greater insight into the heart of Jewish cuisine. 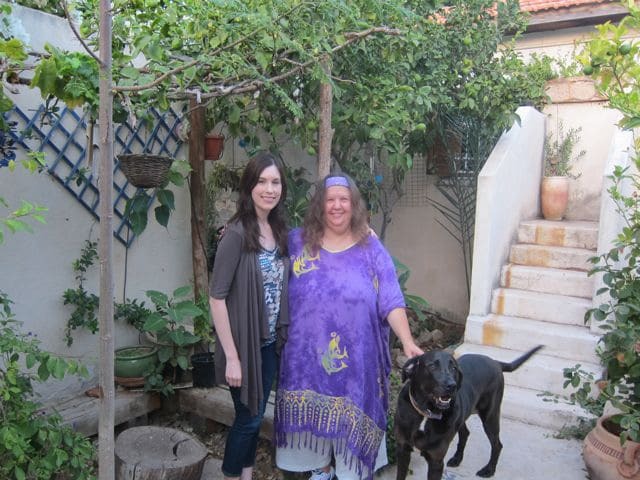 On my recent trip to Israel, I was invited to have dinner with our friend Gila Ronel. The Torah teaches a lesson in moral conduct, that man shall not eat meat unless he has a special craving for it… and shall eat it only occasionally and sparingly. 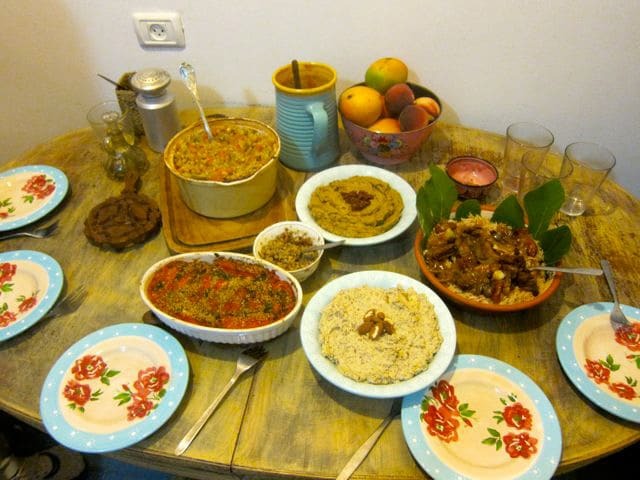 Historically, legumes, grains and vegetables have been the staples of the Jewish diet. In Biblical times meat was considered a luxury for most people. It was too pricey to enjoy at every meal—as such, it was only served on special occasions and holidays. In Gila’s kitchen, you don’t miss the meat. She approaches vegetarian cuisine with imagination and joy, creating dishes that are unique, nutritious and tasty. 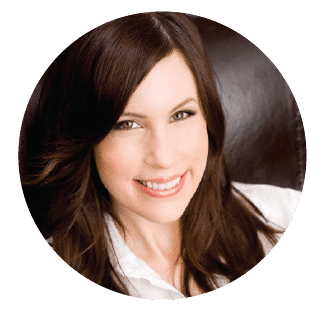 She takes a natural, holistic approach to cooking. Many of her ingredients are taken straight from the trees and plants growing just outside her kitchen. 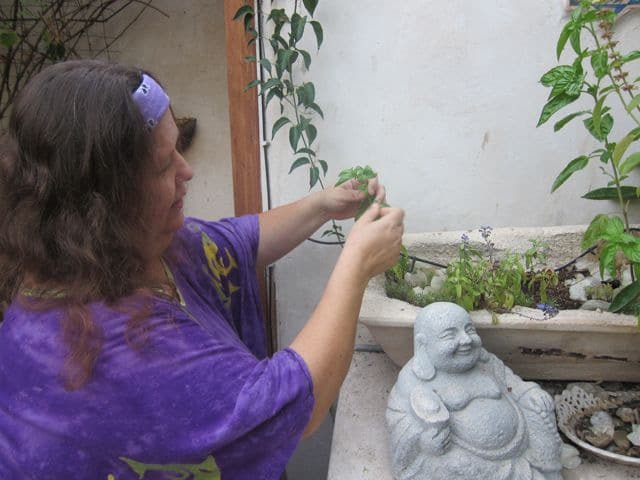 As we cooked, she periodically walked me into her garden to collect herbs that she used to season our meal. One of the dishes Gila taught me to make is her Stuffed Peppers with Goat Cheese. 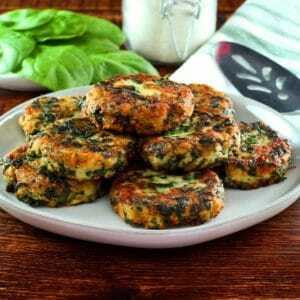 It’s a tasty side dish that can be served as part of a dairy meal. 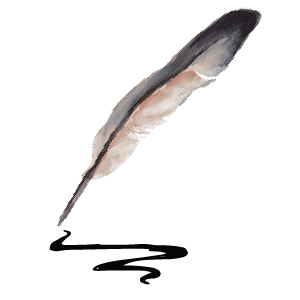 The recipe appears at the end of this blog. You might be unfamiliar with one of the ingredients in this dish—it’s called hyssop. Hyssop is a popular herb in Israel; it’s been used there since Biblical times. In fact, hyssop is mentioned several times within the Torah. In Leviticus, the priests of the Temple of Solomon use the herb for purification rituals. The popular Middle Eastern spice known as za’atar is primarily made of hyssop. Unfortunately, hyssop is difficult to find here in the U.S., particularly the fresh kind. You can sometimes find it in Middle Eastern shops or farmer’s markets, but I’ve never seen it in my regular grocery store. It is pretty easy to grow in warmer climates, so if you have a garden you might want to consider adding this zesty, earthy herb to your collection. I highly recommend it, the flavor is wonderful– similar to a wild oregano, but more intense with a hint of mint. 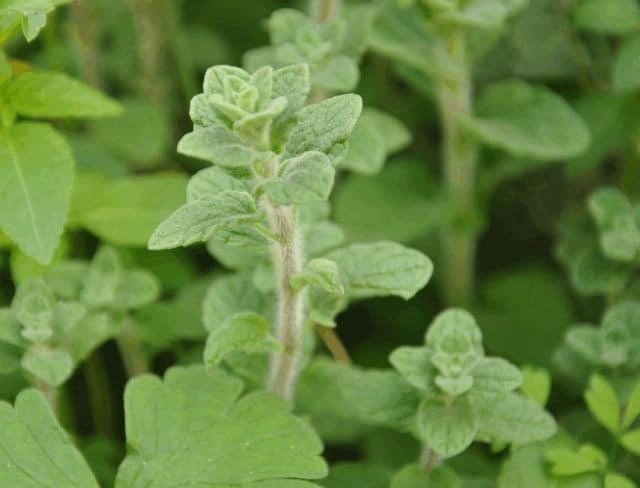 If you can’t find fresh or dry hyssop, you can add and additional 1 tsp sage and 1 tsp minced fresh mint to the mixture. Feel free to adjust the herbs according to taste or what you have in your garden or spice cabinet. I’ve provided dry herb amounts here, but I do recommend you use fresh herbs if possible—they really enhance the natural flavors in this dish. Note: Since first posting this dish, I have tried it with feta cheese instead of goat cheese– and I loved it! Both cheeses are yummy, but the saltiness of the feta really compliments this dish. Feel free to use either type of cheese. 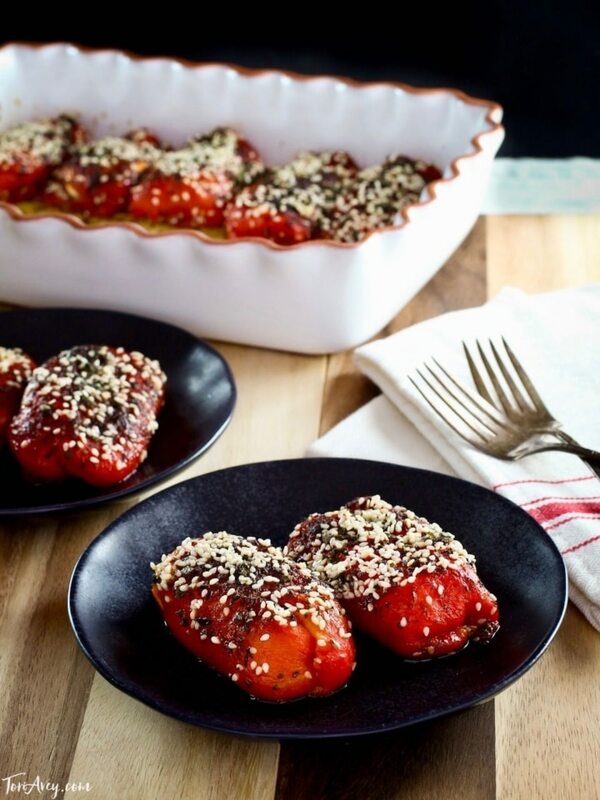 Learn to make roasted peppers stuffed with goat cheese, topped with sesame seeds and fresh herbs. Recipe, Kosher, Dairy, Healthy, Jewish. 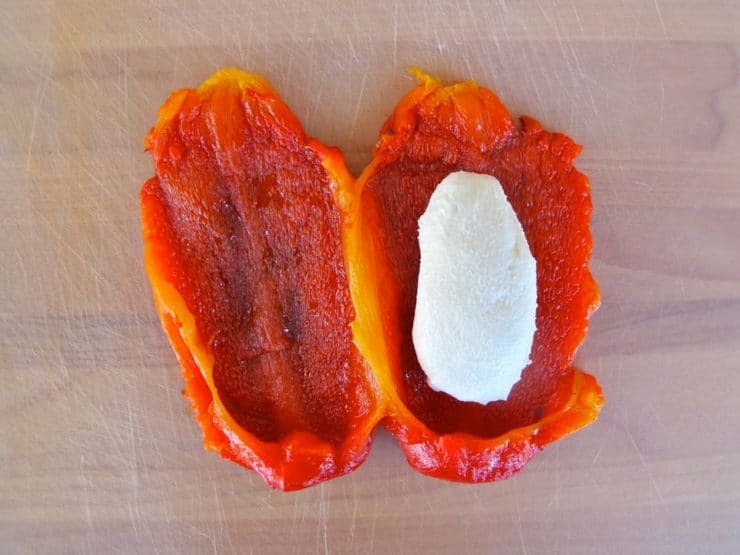 Take a roasted bell pepper and place it on a cutting board. Slice the pepper vertically from top to bottom and spread it open. 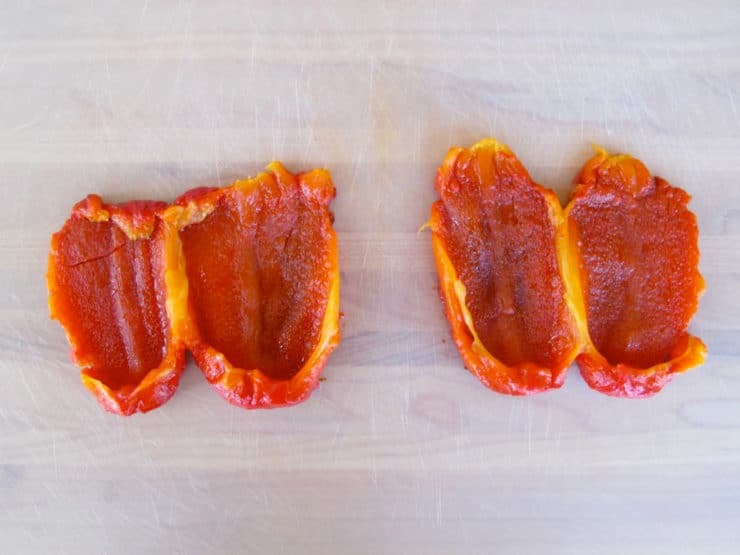 Cut the pepper flesh in half, slicing it from top to bottom so you have two equal-sized pieces of roasted pepper. Repeat this process for the remaining bell peppers. You will end up with 10 pieces of roasted pepper. Preheat your oven to 300 degrees F. Grease a small baking dish with extra virgin olive oil, then sprinkle the oiled surface with salt. Place one of the roasted half-peppers on a cutting board with the inner side facing up (the side that used to have skin on it should face downward). Form 1 tbsp of the cheese into an oblong oval shape. Press the cheese into the center of the pepper. Wrap the ends of the pepper up around the cheese and pull the sides across till it makes a little package. 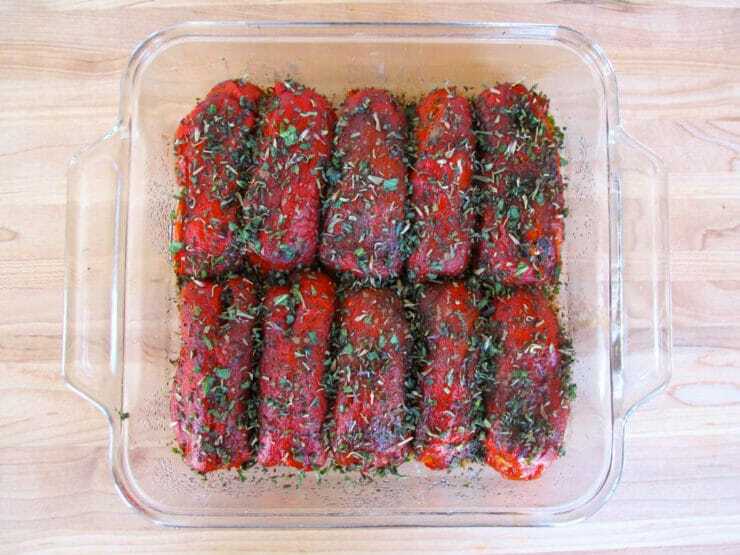 Turn the stuffed pepper over and place it into the bottom of your baking dish, seam side down. Repeat the process until all the pepper halves are stuffed with cheese. 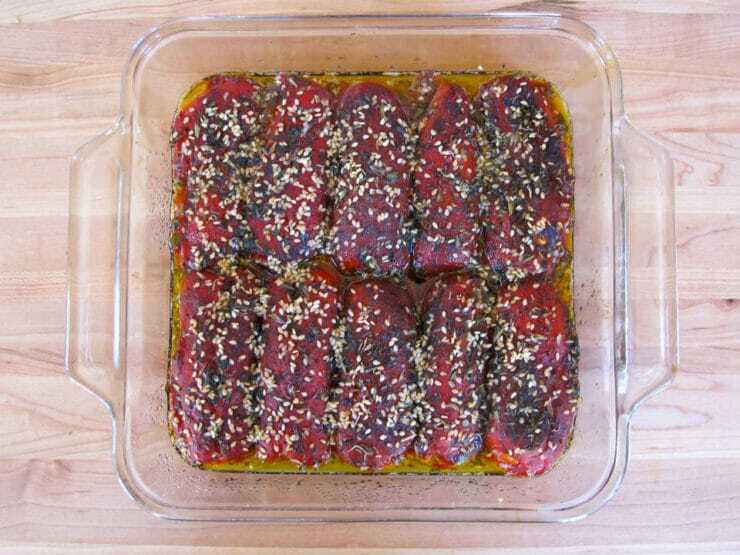 Sprinkle the tops of the stuffed peppers with allspice. Mix the fresh or dried herbs together in a small bowl till well combined. Sprinkle the herbs evenly over the top of the peppers. 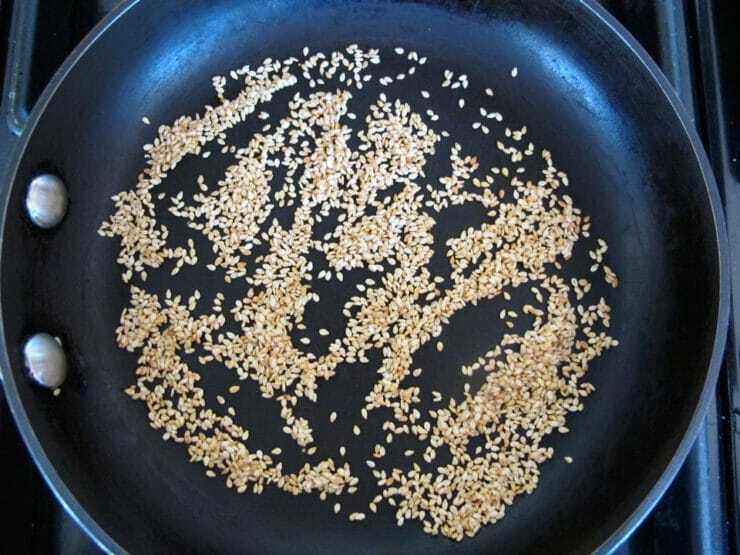 In a skillet, toast 1 tbsp sesame seeds over medium heat till lightly browned. Sprinkle the toasted seeds on top of the herbs. Alternatively, you can use pre-roasted sesame seeds or gomasio. Drizzle the tops of the peppers lightly with olive oil and sprinkle the entire surface with salt to taste. Place the dish in the oven and bake at 300 degrees for 30 minutes. Serve hot. Substitution Note: If you can’t find fresh or dry hyssop, you can add and additional 1 tsp sage and 1 tsp minced fresh mint to the mixture. 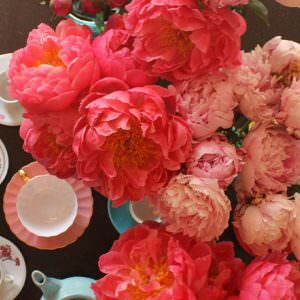 Feel free to adjust the herbs according to taste or what you have in your garden or spice cabinet. I’ve provided dry herb amounts here, but I do recommend you use fresh herbs if possible—they really enhance the natural flavors in this dish. Do you know the hebrew name of hyssop? I will be in Israel soon and would love to get some. thank you so much! Shvi’i shel Pesach is so long this year and I’m in trouble trying to figure out so many festive meals! looks great. how do i make lemon parsley couscous to go with it? It also looks beautiful <3 Is it really spicy? Lisa it’s super mild, unless you use spicy peppers. I usually use bell peppers which are sweet. So good! This looks wonderful! I would love to see the rest of your friend’s recipes! Just made this last night, LOVED it! Used a selection of different colored peppers and served each pepper on a small mound of lemon parsley couscous. Awesome dinner, thanks! So happy you loved it Olivia! Serving it on top of lemon parsley couscous is inspired. Great idea! Tori, since I have zataar on hand and it’s mostly hyssop, could I substitute it? Perhaps also keeping the mint, since I generally have it too? I just got some really wonderful feta at our local Middle Eastern shop here in the west of Ireland, and this would be a terrific place to use it! Thanks! Hi Nancy, absolutely! The seasonings are very flexible in this dish. I think za’atar would be delicious. The feta version is terrific, I tried it and I think I like it even better than the goat cheese. Enjoy! Tori, the red pepper with cheese is on the menu for later this week – it sounds just wonderful. Any chance that you will be sharing the recipe for the Eggplant Dip with Sun Dried Tomatoes at a VERY early date? This is the first time I am viewing your recipes. I like the idea of using a red pepper. My husband and I cook green bell peppers on the grill so we will have a nice smokey flavor, we peel and de-seed the pepper, insert feta cheese, and continue cooking in a fry pan with olive oil to warm up the feta. The stuffed bell pepper is fabulous. I can hardly wait to check out more of your recipes. Do you have a traditional baked chicken recipe? 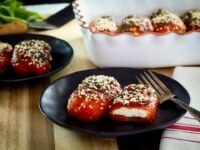 Tori, I made this recipe and posted a pic on your FB page…. it is simply amazing! 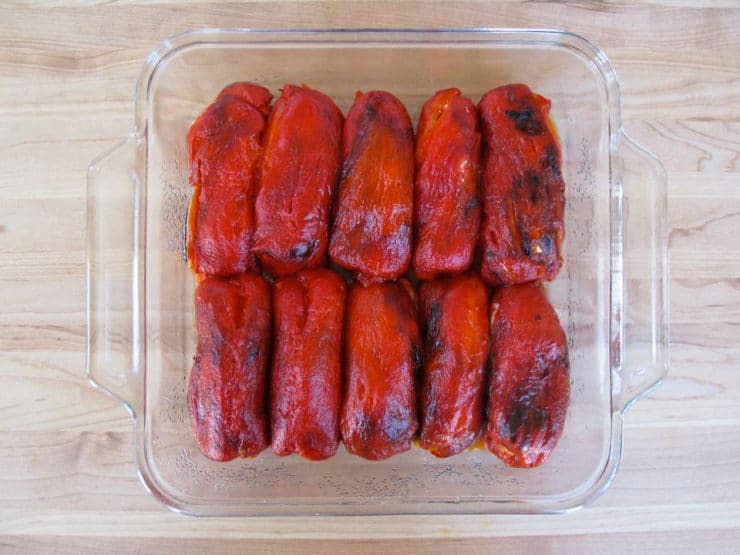 Gila’s stuffed peppers will forever be a part of my family’s recipe collection now! I can’t wait to try this! 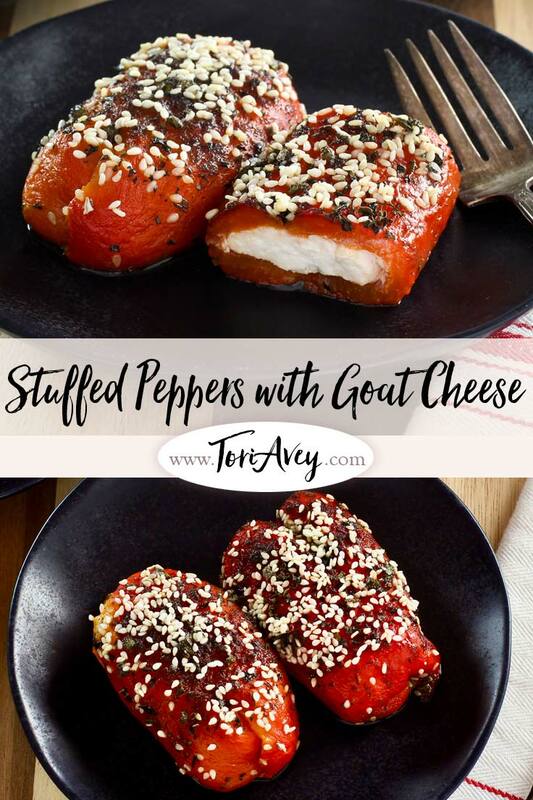 Two of my fave foods are roasted red peppers and goat cheese. I am not much of a meat eater, actually I could do without meat all together, but my sister and our children like meat at most every meal. Thanks Shiksa! Thank you for the lovely article, I very much wish I could have joined you at Gila’s table. The menu sounds divine. I’ve been following you for a while and just reading your recipes always make my mouth water. Great work. Darling we’ve missed you! Happy you’re back, can’t wait to hear more about your traveling advenctures. Isn’t the cheese in Israel the best in the world?? Where’s the BEEF? Just kiddin. Looks good. Bet they’d be even better wrapped in foil and tossed on the BBQ. Like the article too. Keep up the good work lady.